Kenny Jackett expects Gareth Evans and Jamal Lowe to brush off knocks in time for Walsall's visit to Fratton Park on Tuesday. The pair were forced off during Pompey’s 2-1 League One triumph at Scunthorpe on Saturday. There was concern for Evans, who was down receiving treatment before being replaced by Christian Burgess on 79 minutes. That came after the midfielder scored Blues' decisive second goal five minutes before half-time – taking his tally to seven for the season. It also appeared as though winger Lowe may have picked up an injury when he was substitutes for David Wheeler in the 84th minute. However, Jackett insists the influential pair only picked up minor injuries. And there is no concern either will be absent against the Saddlers. The Pompey boss said: ‘There were a couple of bumps and bruises. ‘Gareth was one and Jamal was the other. ‘But I fully expect both of them to be training on Monday and available for Tuesday's game against Walsall. Evans has proved a potent goalscoring threat in the number-10 role this season. 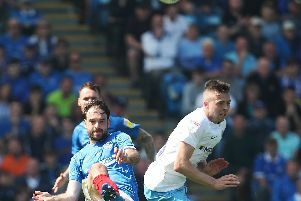 The former Manchester United trainee moved level with Lowe at the top of scoring charts during Pompey’s maiden win at Glanford Park. The Blues' second goal was well worked before Evans' smart looping finish beat Iron goalkeeper Jak Alnwick. Jackett hailed the quality his skipper displayed in the final third. He added: 'Gareth does have some real quality around the box. 'I always think, even sometimes in a quiet game, he can come up with a goal. 'It was a real quality goal that one (the second one).